If U.S. strikes Syria, what happens next? In a clear reference to his allies in Iran and the Islamic militant group Hezbollah, Assad warned that his government is "not the only player in this region." "You have different parties, you have different factions, you have different ideology. You have everything in this region now," said Assad, who has been accused by the White House of killing 1,400 of his own people in an Aug. 21 chemical weapons attack on the Damascus suburbs. Asked by Rose whether any retaliation for U.S. strikes could include the use of chemical weapons, Assad -- whose government has never confirmed officially that it even has chemical weapons -- said it would depend "if the rebels or the terrorists in this region or any other group have it. It could happen, I don't know. I am not fortune teller." Rose said Sunday on "Face The Nation" that the Syrian dictator was "remarkably calm" during the interview as he addressed the claims that he had gassed his own people. 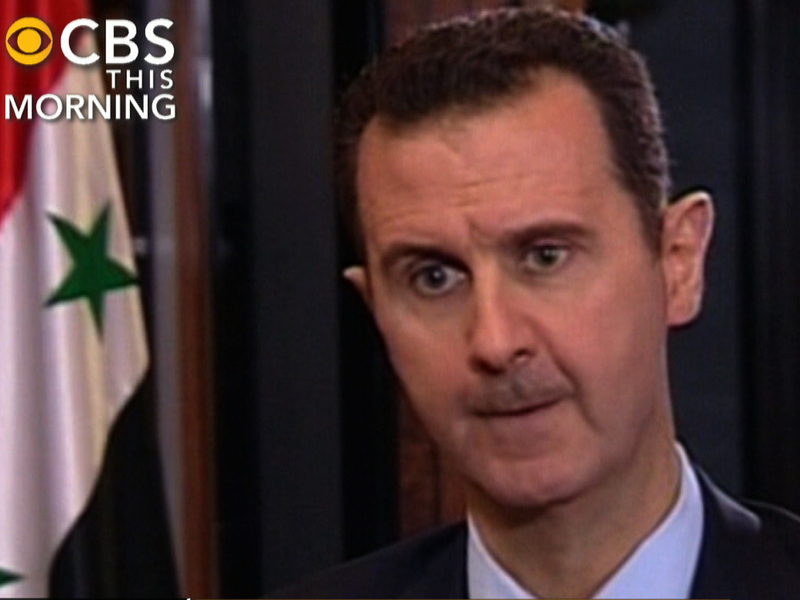 Rose's full interview with Assad will air Monday night on PBS's "Charlie Rose". More excerpts were released Monday on "CBS This Morning." Assad's government has blamed the Aug. 21 attack in Damascus' eastern Ghouta suburbs on opposition forces which have been battling to topple him from power for more than two years. Assad says any U.S. strike on Syria "is going to support al Qaeda"
Russia has also suggested the rebels could have been behind the attack, and Moscow continues to urge the U.S. to delay any military action at least until a team of United Nations inspectors issues its report on the incident after collecting samples and evidence on the ground in Ghouta. The report is expected by mid-September, but will offer conclusions only on which chemical agents were used and how -- not on which side used them. The Obama administration believes the evidence is already clear, based on secret intelligence allegedly showing Assad regime troops preparing for and even carrying out the attack on Ghouta using missiles tipped with chemical warheads, and intercepted communications between regime officials on the day of the attack. But while the White House has shared that intelligence with some members of Congress, and has managed to convince a few skeptical lawmakers, its public case for punitive action against Assad is based largely on circumstantial evidence. U.S. officials and their allies around the world insist the Ghouta attack could only have been carried out by the Syrian government because only the Syrian military possesses the missiles, chemical agents and know-how necessary to successfully deliver a deadly toxin like sarin gas on such a wide scale. Secretary of State John Kerry has spent days trying to garner international backers for any U.S. military action in Syria, but he's managed to get firm commitments only from France and Saudi Arabia. Kerry said Sunday in London that Saudi Arabia was supportive of a U.S-led strike and was convinced Assad was behind the Ghouta attack -- and he expected other Arab countries to issue statements of support on Monday, reported CBS News correspondent Margaret Brennan. But few were expected to say they would join in a military strike. Kerry got a similarly hesitant response from the European Union on Saturday, which urged the world to send "a clear and strong response," but asked the U.S. to delay any action until the U.N. weapons inspectors finish their report.